Click chart to see long-term market trends on the Hang Seng. Enthusiasm swept through Chinese markets Monday as investors cheered the release of an ambitious blueprint that will guide economic reforms in China over the next decade. 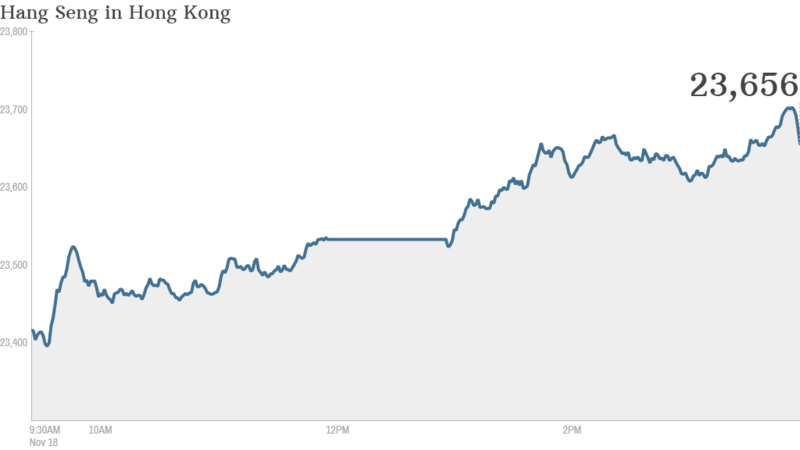 Reacting to the plan, which addresses social and economic trouble spots from polluted air to land rights, investors pushed stocks in Shanghai and Hong Kong to gains of almost 3%. The laundry list of reforms -- which include 60 specific tasks -- is the result of a four-day meeting of top Communist Party officials led by President Xi Jinping. Held in Beijing, the summit was the first major opportunity for Xi to decisively push his party toward the painful economic reforms needed to maintain economic growth. For a while, it looked like the meeting might not produce a meaningful roadmap. An initial outline published Tuesday lacked specifics, and seemed to raise more questions than it answered. But the latest report from the government details a range of social and economic initiatives, accompanied by more specifics than many analysts had expected. For some, the summit was seen as a make-or-break moment. After decades of exponential expansion, China's economy is entering a period of slower growth, and Beijing is under pressure to address issues that threaten further development and social stability. Economists say China must find a way to balance growth by moving away from an economic model in which cheap credit and exports drive growth. Instead, Beijing should encourage domestic consumption and innovation. "Questions will remain over implementation," said Mark Williams and Qinwei Wang of Capital Economics. "But this is the most impressive statement of reform intentions that we've seen this century." Beijing's plan calls for opening its financial markets and promoting greater foreign investment. The document also hints at changes in how companies file for stock market listings, the introduction of a bank deposit insurance scheme and an acceleration of interest rate liberalization. The roadmap seeks to roll back government control of state-owned enterprises and allow for greater competition with private firms. The government also said it would gradually reform the country's household registration system, known as hukou, which affects everything from employment to social benefits. Other initiatives tackle China's pollution problem, promote social security programs, and call for a relaxation of the one-child policy. Started in 1980, the program was intended to arrest explosive population growth, but has since led to other issues including a diminishing supply of workers. The plan also seeks to abolish labor camps. Still, some questions remain. Although the second document was more detailed than analysts expected, it is silent on other looming issues including a rise in local government debt. Putting the plan into action could also prove to be rather difficult. The country's consensus-driven approach to policymaking could make for slow progress in translating the principles adopted at last week's meeting into real change for private companies, consumers and foreign investors. And while the one-party system might avoid Washington-style gridlock, reformers still need to get regional and local governments on their side and convince party conservatives that change is for the better. "A policy document, however weighty and well put-together, does not in itself change anything on the ground," said Capital Economics.